The all-new Ram 1500 is here for the 2019 model year and it entered the new generation in style. The truck comes improved on all fronts and the best-selling Ford F-150 now has the respectable rival. The new light-duty Ram benefits of many technologies and structural improvements and also offers the 48-volt mild-hybrid system on most options. It also returns larger but at the same time lighter and has expended the interior comfort. The safety is also lifted to the new levels with the active safety systems. The truck again comes with many configuration options. The cab styles include the extended and crew cab forms and with the choice between two bed lengths. The trims number counts to eight and combinations multiples with three engine options, two- or all-wheel drive, etc. At the bottom of the trim scale is the workhorse 2019 Ram 1500 Tradesman but it also offers enough goodies combined with the unique exterior and interior theme. The new Ram advanced in all aspects and of the biggest importance are the structural improvements. 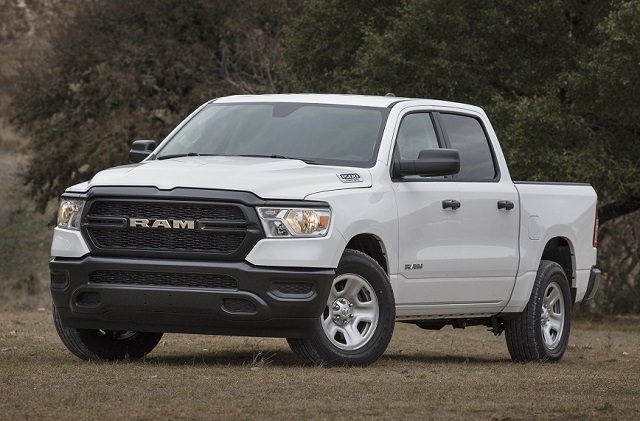 The 2019 Ram 1500 Tradesman and other version sit on the new, re-engineered chassis which boasts both stronger and about 100 pounds lighter design. The model also lost some pounds thanks to the aluminum parts such as the tailgate, steering components, engine mounts, etc. The Tradesman version comes in both currently available cab styles and with the pair of the cargo bed options. All cab versions are 1 inch wider while the crew-cab models measure 3.9 inches longer and ride on 4.1-inch longer wheelbase. 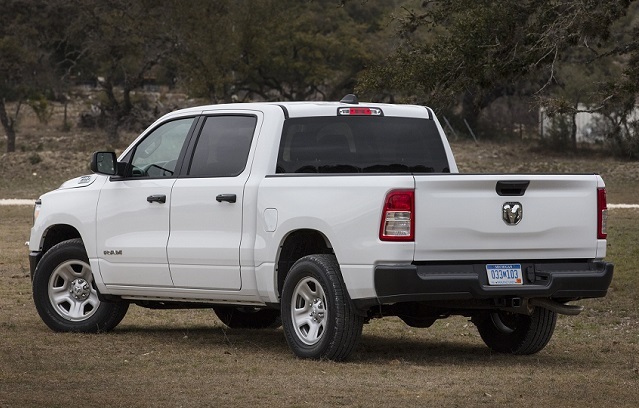 The new light-duty Ram also looks more modern and discontinues the well-known crosshair grille style. The new design is more elegant and changes the theme in each trim. The Tradesman model comes with the black grille and bumpers. It rides on the 18-inch wheels with all-season tires. Inside the cabin, the new Ram is more comfortable and better equipped. The controls are easy to detect and use and higher-grade versions come with the massive 12-inch center screen. The owners of the Tradesman model will get the Uconnect 3 version with the 5-inch screen, voice command and audio streaming. The number of speakers will be six in this version. The interior of the Ram Tradesman will come with the vinyl upholstery and manual 4-way front seats. Other features will include power door locks and front windows, keyless entry, air conditioning, a backup camera, front and rear cupholders, tilt-and-telescopic steering wheel, electric power steering, etc. As for the safety, all versions include stability and traction control, six airbags, rearview camera, and anti-lock brakes. The more advanced safety systems will be available in the top three trims. The standard engine in the 2019 Ram 1500 Tradesman is familiar 3.6-liter V-6 unit know as the Pentastar. This engine makes 305 hp at 6400 rpm and torque of 269 lb-ft at 4800 rpm. The engine comes in the combination with the 8-speed automatic transmission. However, the new-generation Ram 1500 combines the V-6 engine with Fiat Chrysler’s eTorque mild-hybrid system. The system comprises the motor/generator setup in place of the alternator and 48-volt battery unit. This system provides quicker start and boots torque for 90 lb-ft. In the case of the 5.7-liter Hemi V-8, this hybrid unit is optional. The Hemi engine benefits form additional 130 lb-ft of torque. The engine itself produces 395 hp and torque of 410 lb-ft. The turbodiesel Ram 1500 will also arrive later in the model year. The EPA ratings of the V-8 engine will stay at current levels. It is 15 mpg city and 21 mpg highway with the all-wheel drive. The V-6 is yet to be rated but we expect about 10 percent better economy. The 2019 Ram 1500 Tradesman will start at $31, 695 with the Quad-cab, 6’4″ cargo box and rear-wheel drive.